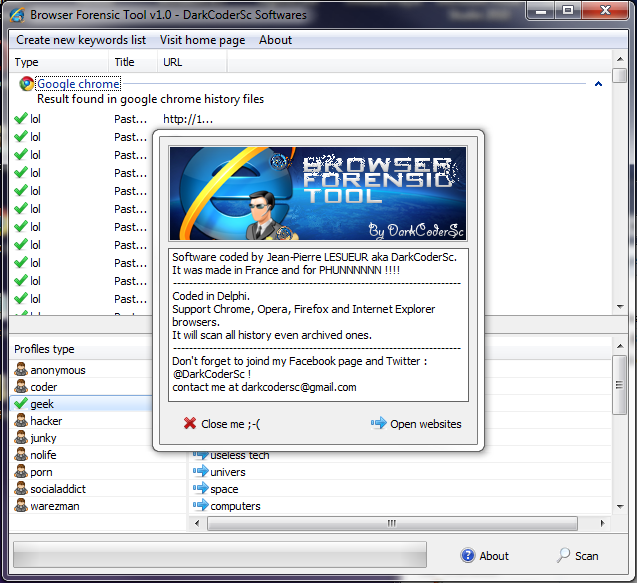 Browser Forensic Tool v2.0 , Developed by DarkCoderSc (Jean-Pierre LESUEUR) ,is an advanced local browser history search engine, in less than few seconds it will extract the chosen keywords of most famous web browser, actually Internet Explorer, Google Chrome, Mozilla FireFox, RockMelt, Comodo Dragon and Opera. BFT will attempt to find the keyword(s) in the history title and search, if the keyword is present or suspected to be, it will be display in the result list with his URL and Title. The software also give you the possibility to edit the default keywords and of course add / modify your own keywords, to separate keywords subject you can create your own keywords categories and only scan for some keywords in the chosen category . The program is fully asynchronous so it won't affect your work during the scan time nor it will block the customization of keywords and keylist and can be canceled at anytime.